Advanced Fibreglass Techniques: Epoxy v Polyester – Who does it better? The Fibreglass world has evolved over the years as technology and experience continue to shape how we see and use fibreglass, resins and laminates. Prior to the emergence of epoxy resin, fibreglass boats and other vessels or parts were repaired with polyester resin and typically worked well if your repairer was experienced and knowledgeable. So if polyester worked well, why did we need epoxy? Read on to find out the benefits of using epoxy in your marine repairs. The differences between polyester and epoxy resin are numerous. Polyester resin is still used frequently throughout the marine industry purely for its cost effectiveness in the manufacturing and construction of new marine vessels when it is combined with fibreglass support. Polyester can be frail and prone to micro cracks in the resin between the fibreglass. It also varies in effectiveness when used on laminates and certainly is not usable on products made using vinylester or epoxy materials. In contrast epoxy resin can be used as an effective adhesive, laminator and coating across multiple applications. Epoxy also provides a better quality of moisture barrier and is not as prone to micro cracks. As an adhesive, epoxy is able to bond with most substrates from wood and metals, polyester to vinylester and graphite fibre. Polyester resin has a relatively short shelf life of up to a year from its manufacture date which can be quite inhibitive if you are not using the resin for large project or frequently. Polyester also requires higher temperatures to cure, meaning it may be cost effective, but it takes longer to start and finish a project. Whilst catalysts can be used to assist in the curing process, this can cause imperfections. Epoxy resin in contrast, has a shelf life that spans a number of years and has a lower curing point when hardeners are incorporated. This allows the resin to be used across a range of temperatures to repair structural damage in boats and for other purposes. Epoxy resins give off slight fumes and are typically not flammable, whereas the polyester resin fumes are pungent and flammable. As with any other industrial chemicals, both resins should be used in line with safe working practices. Many different tests have been carried out to determine the difference in repair strengths of polyester and epoxy resins. The majority have come out showing that epoxy leads the way with roughly 10% greater repair strength over the polyester. While it looks like we are very much on the epoxy resin bandwagon, we do recognise that for many decades, polyester was the only option. Polyester and vinylester resins are the resins which we carry out the majority of our repairs with. Epoxy resin is still our choice for repairing fibreglass where a stronger repair is needed or when we are unsure of the what resin was used in the manufacturing of the original product. The positives of epoxy far outweigh any negatives and certainly outnumber the positives for polyester. We like to use the techniques we have learned over our 20 plus year careers, however we also like to make sure we are providing our customers with the latest techniques. We are confident that using epoxy resin, when required, in our fibreglass repairs is one way that we keep our customers satisfied. 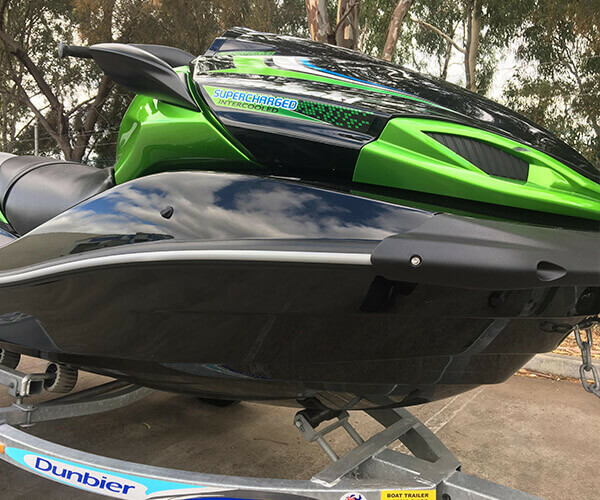 At Advanced Fibreglass Techniques, we use the latest techniques to repair your watercraft, whether it be a small cosmetic repair or a structural modification. Contact Mark or Nigel today, on (08) 8182 4877 or drop in for a no obligation free quote. Getting your boat summer ready? Here are our handy hints to maximise your time on the water. Manufacturing and Fibreglass, How AFT provides superior quality every time!